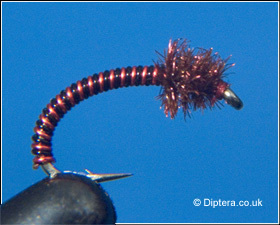 There are many variants of the so called "Brassie Buzzer". The brassie buzzer originally got its name from the copper colour of the wire windings used to create its body. Nowadays the term "brassie" is used to describe the size of wire and is available in many different colours. It's an ideal buzzer for deep searching due to the added weight of the wire. This allows the buzzer to get down deep very quickly. This is a very effective buzzer and can be made in a variety of fluo colours including "hot orange" and "hot yellow". The fly can be fished like many buzzers on either an intermediate or floating line using a very slow figure of eight retrieve. This buzzer can sit 2-4 feet below a dry fly used as an indicator and fished close to weed beds in shallow water. Copyright © 2002 - 2018 "Diptera.co.uk". All rights reserved.